Grand Theft Auto is the king of the open-world genre. With minor exceptions, it has pioneered every notable mechanic in the genre, and has reinvented or perfected anything borrowed. It’s been a focus of nearly every flavor of controversy since the beginning, and it wears that fact like a fine coat. Rockstar is a developer that prides itself on quality, and it makes not apologies for it. Grand Theft Auto V has been a long time coming, and it is a masterful chapter in the franchise. Grand Theft Auto V boasts a stronger and more compelling opening than any GTA game to date. Things start in the midst of a bank robbery and subsequent shootout and chase involving infamous criminal Michael and his lifelong friend and partner in crime Trevor. The robbery goes sour and the ensuing battle separates the men. Flash forward several years later, and Michael is a wealthy, retired family man in witness protection up in sunny Vinewood. He’s bored, miserable, and his family hates him. In south central Los Santos, small-time gangbanger Franklin spends his days running a repo service for a shady credit fraud car dealership. Finally, the estranged Trevor is about to enter back into Michael’s life and make things even more complicated. 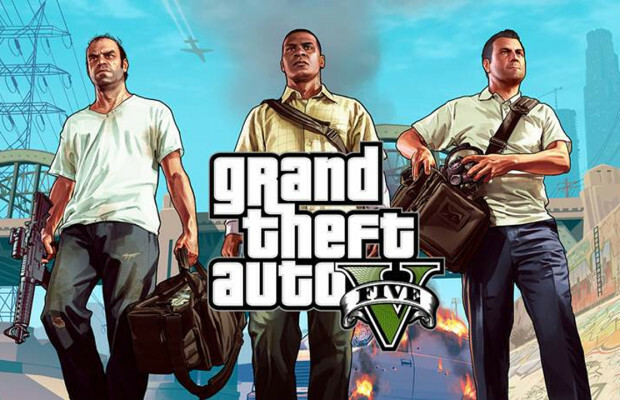 True to the nature of GTA, the main and supporting characters crisscross each other in amusing, startling, and exciting ways, and the 20-30 hours of story here are some of the best of the generation. It wouldn’t be Grand Theft Auto without razor-sharp satire and social commentary. As always, Dan Houser and team knock it out of the park. There’s an air of spoiled decadence here, of a hunt for the American Dream gone sour. There are politics, corruption, and other issues that mirror current events. The brilliance of the script lies in how carefully it toes the line of satire. These are razor-thin boundaries, and it manages to stay within them while remaining relevant. It still manages to have fun, as well; this is likely the funniest game of the series, with several laugh-out-loud moments mainly coming from Trevor and a hilariously adamant marijuana activist with the strongest pot in the state. The story and characters are sprawling and unique, even for GTA. Nearly all of the past games involved characters forced into circumstances beyond their control, running errands to make ends meet and doing favors without any other option. The characters in GTA V have the drive for money and power. These characters are driven by their own primal urges at nearly every turn, and the nuances of each character are impressive. Franklin is the closest to past protagonists, and his early missions hearken back to San Andreas. Trevor is a full-blown psycho; his introductory sequences involves him murdering the man who confronted him for cheating on his wife, and a later mission is a controllable torture sequence followed immediately by a trip the airport to help the victim escape. Trevor’s morals are all over the place, and his character is startlingly unpredictable. However, Michael is by far the most best of the three. He’s out of place in this world and he knows it, past his prime and itching for action. This older man has a lifetime of regrets and it’s incredibly compelling to follow him as he tries to uphold the house of cards that is his life. The voice acting here is stellar. The three protagonists are masterfully voiced (particularly Trevor), and truly make these characters seem like living, breathing people. In a series first, all three of these characters are controllable and can be switched between generally at will. Unless there’s a wanted level or a specific mission that restricts it, you can move between all three characters at any time. In the missions where all three men are involved, this incorporates a bit of strategy. You can be piloting a helicopter, rappelling down a building or shooting from the side of the helicopter in turn, as needed. In firefights, you can switch to one man to flank the enemy before switching back to your partner to hold the line. Even in the ambient goings-on of Los Santos life, the game makes the charters more immersive. Switch to Franklin, and he may be finishing up an argument with his aunt. Transition over to Michael, and he might be sitting dejectedly in his car. It’s such a small touch, but it makes it seem like you’re jumping back into the middle of a character’s life after he’s been spending his time as an NPC living his own life instead of waiting for player input. That’s just the first indication of the love put into the game. GTA V is a careful amalgamation of the best possible elements from all of Rockstar’s games. The shooting system is finally perfect; it draws from both Max Payne 3 and Red Dead Redemption, which themselves built on the foundation set by GTA IV. Now, the cover system and shooting mechanics feel incredible, and a brief, subtle screen flash to accompany the death of a foe makes the shooting have more feeling than it is consciously thought about. Driving has been greatly improved from the last game as well. Cars feel a bit lighter and don’t slide around enough, which gives things a bit more of an arcade feel but makes great strides towards achieving the same feeling as the shooting: that zen-like state of simply doing it, rather than trying to make it happen. Cop chases have also been favorably tweaked; now, it’s a matter of getting far enough away and staying away while the Wanted level runs out. Instead of being blessed with massive spheres of omniscience, cops now have a small sight cone a la Metal Gear Solid, and you merely have to dodge those to be in the clear. It’s incredibly satisfying to get away, whip into a dark alley and hold your breath as the cops pass, hoping they don’t turn the corner. There’s an inherent thoughtfulness to every facet of the design, right down to the decision to restore the recognizable font from the earlier games. In addition, there are now checkpoints within missions, a welcome addition. Each of the activities are incredibly unique, with the surprisingly deep and detailed golf activity promising to take over great amounts of time. There’s even a stock market, where stocks of a company will rise and fall based on what’s happening with its products and people in the world. If you buy stocks in a company and assassinate the CEO of its rival, you stand to gain a great deal of profit. RPG-lite stats return from San Andreas–the more you shoot, the better your shooting stat gets, and the better shot you will be. The game world itself is not only absurdly huge, but widely varied in its locales and absolutely packed with things to do. It’s the heists, however, that truly stand out. The best mission in GTA IV is small potatoes compared to what happens here. Heists are massive, multi-part missions with tons of planning and moving pieces. They generally start with casing the target. Is there a good point of entry, or a favorable method of attack? After that, you need to secure the supplies by going around the city and stealing the necessary vehicles or weapons. Next comes hiring the crew. More skilled crew members will make things run more smoothly; a great hacker will widen the window for the heist, while a great getaway driver will make the escape less of a hassle. However, these talented individuals will demand a larger cut of the spoils. If you’re feeling stingy, there are some crew members that only require single-digit percentages, but stand to flub the job. I went with the cheapest people for the job on my first heist, splurging only on the hacker. Her handiwork made the actual heist successful, but her bargain-basement teammates made the rest of the job disastrous. There are a lot of choices to be made here, and these will govern the outcome of the mission and how rich you are as a result. The insane amount of content in the game can’t be adequately covered in a review. This is likely the most jam-packed open world game yet. In addition to the aforementioned golf game, there’s also racing, base jumping, tennis, swimming, and triathlons. Ride a Ferris wheel, go diving, do yoga, or touch a stripper the right way to win her heart. Buy and manage property, and do even more missions for them to increase your revenue. Use that money to buy vehicles and wade through the ocean of customization options. To be bored with the game’s activities would require actual effort. Grand Theft Auto V is Rockstar’s magnum opus, the best GTA game to date. This is the pinnacle of everything that has come from the developer thus far, a cocktail of everything that should be in an open-world game. It constantly gets better, and keeps on giving more content and things to do. This is a Skyrim-level of gameplay richness, and the cohesion of this world is practically unparalleled in gaming.